Today’s IT organizations are justifying more of their inves tments based on the projected business process improvements enabled by the purchased technologies. In fact, 70% of IT buyers state that business value and outcomes take precedence over cost-based decision-making when selecting a given technology1. At Riverbed, our customers know that application performance equals business performance. That’s why they rely on the Riverbed Application Performance Platform™ to gain unparalleled visibility, optimization, and control over all critical applications and IT services across the hybrid enterprise. It’s this prevailing customer objective, coupled with an increased focus on accelerating and amplifying the business value of technology investments, that inspired Riverbed Professional Services to engineer three new service offerings, generally available today, as part of a robust suite of Optimize Services. These service offerings help drive the business outcomes customers expect by optimizing solution performance, ensuring widespread adoption, and linking the value derived from the Riverbed Application Performance Platform to the metrics that matter to their business. While IT budgets are recovering in 2015, 68% of IT leaders report cutting costs and becoming more efficient are still medium to high priorities this year2. And though more IT jobs are emerging, those positions are confined to a few select areas, and the pace of hiring continues to be sluggish. So how do organizations balance costs, a scarcity of resources, and move forward with a long list of ongoing IT initiatives? By ensuring they get every benefit they can from their technology investments. 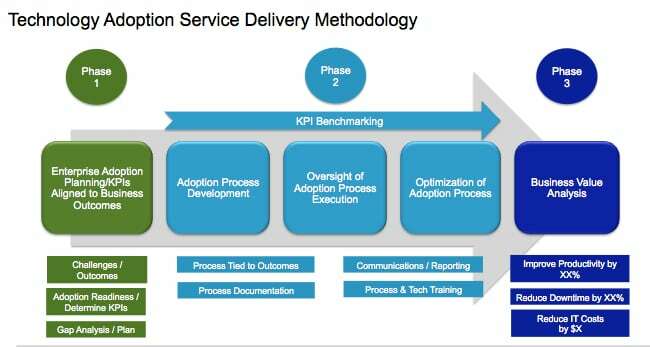 The Technology Adoption Service improves the long-term business value of Riverbed solutions by assessing and directing the activities needed to achieve widespread solution adoption. 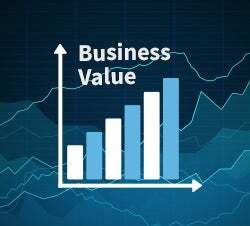 The service integrates a customer’s technology investment into best practice operational processes, helping the customer measure business value by linking key performance indicator (KPI) improvements enabled by Riverbed solutions to their desired business outcomes. Today’s hybrid world introduces complexity and change, as organizations are managing a combination of on-premises, cloud, and SaaS apps traveling across a mix of public Internet and private MPLS connections. And when you incorporate other game-changing technologies, such as mobile, cloud, and virtualization, the impact on an enterprise infrastructure can be even more profound. In light of such complexity, it’s imperative that customers thoroughly understand the interplay between their Riverbed® SteelHead™ deployment and the changes they introduce to their infrastructure. The Optimization Assurance Service assesses a customer’s SteelHead deployment and delivers recommendations to maximize the performance of critical applications. The service also provides best practice troubleshooting and change management guidelines so customers can confidently protect and optimize their SteelHead appliances even as their applications and networks continue to evolve. Nearly 80% of our customers report that a slowdown with mission-critical apps would cause a moderate to severe effect on overall business performance. Compounding these performance issues is the ever-increasingly complex infrastructures IT teams must contend with when delivering applications. Lastly, data and resources are often outside of a customer’s immediate control in today’s hybrid enterprise. So as you can imagine, staying on top of application performance problems can be costly and too time consuming. It doesn’t have to be. Not with the Application Analytics and Diagnostics Service, which helps customers proactively assess critical on-premises, SaaS, and cloud applications to improve end-to-end performance. The service includes baselines to understand current performance; troubleshooting and root cause analysis to isolate and correct problems before they become severe; and performance trending to help prevent future problems from occurring. Many Riverbed customers are already experiencing the benefits of the new service offerings, as illustrated by these three customer success stories. This customer was spending too many staff hours trying to troubleshoot and resolve performance issues that were impacting critical applications. In some cases, the customer spent 200+ hours trying to determine root cause, as limited visibility into the network prevented them from quickly isolating the impacted domain. The customer purchased Riverbed® SteelCentral™ to address this issue, and wanted help quickly operationalizing the solutions while demonstrating business value. Through the Technology Adoption Service, RPS developed a custom process that combined the customer’s existing monitoring solution with SteelCentral, helping them trace the network path and determine root cause in just one hour. This 99.5% reduction in time spent conducting root cause analysis represented a significant improvement in a priority KPI, as excessive troubleshooting time for a single application had cost the company $230K. Faster root cause analysis can be tied back to business value, as a decrease in downtime means lower costs, better resource allocation, and higher customer satisfaction. This customer has a SteelHead deployment that consists of about 200 appliances. While some quick analysis showed the SteelHeads were perfectly operational, a few small configuration errors were causing some appliances to yield lower-than-expected optimization levels. The customer also lacked clearly documented change control processes, where updates to the infrastructure were put into production without considering how they might impact applications that were being optimized by SteelHead. To improve the business value of SteelHead, RPS delivered the Optimization Assurance Service. As a result of the consultants’ efforts, the customer experienced significant increases in data reduction and percentages of optimized traffic. Enhanced user experiences for critical applications will result in more productive employees. And finally, the change control processes that RPS introduced as part of the engagement will help the customer better prepare for upcoming IT change. This company’s applications that track drug trials and help them maintain FDA compliance are critical enablers of the business. But when application users across the globe began reporting performance issues, the client’s key stakeholders knew they needed to confirm degradation was taking place. More importantly, they needed a better view of overall application health to more effectively monitor, analyze, and manage performance moving forward. RPS was engaged to deliver the Application Analytics and Diagnostics Service. Following the initial performance baseline, the client had a set of findings and actionable recommendations to improve performance for the targeted applications. And after the consultants conducted the second round of analysis, the client finally had the trending data that allows them to pinpoint fluctuations in performance as changes are introduced to their application infrastructure. The net result is the customer has better application intelligence, which can be fed into future development cycles to eliminate future service disruptions. And more mature processes for troubleshooting and understanding end-to-end performance means the customer is more agile and responsive when issues do occur. In an IT landscape where a heavier emphasis is being placed on achieving desired business outcomes, it’s never been more vital to protect and optimize the value of your Riverbed investments. At Riverbed, our customers should always expect more value, and we’re committed to delivering it – quickly and consistently. Learn more about our new service offerings by checking out the embedded SlideShare and the related links below.